How Inconsiderate and Selfish - Look what I made! This Nissan Van slid in and made access to the Saturn impossible. Today, I pulled my Saturn Vue into the parking lot and took the space under the tree because on this hot day, I wanted a little shade. When I arrived, there was ample space and as you can see, I am between the lines almost perfectly. While in the store, this Nissan van arrived. What you see is an impossible situation concerning access to my vehicle. What you don’t see is that on the other side of the white car next to mine, are a line of about 10 to 15 empty spaces as BJ’s was not crowded on this day. Also the back wheels are clearly in my spot, but the front wheels are turned severely to the right which means this car came into the spot and never straightened or adjusted in the least. Furthermore, his passenger side mirror is beyond mine but within about an inch. I was clearly angry. I thought…who in the world would do this? Since I found it hard to believe, I took the picture. I then uploaded it to Facebook. I was angry. I am 55 years old, 233 pounds, I have two bad knees and I can’t go climbing around any car without risking injury to myself or damaging the car. My choices were limited. I could return to the store with the license number in the hopes that the store would call for the owner of the car to come out and move it. I have never heard an announcement in a BJ’s store for anything and the reason is clear…it’s a warehouse and its cavernous nature would make any announcement be inaudible. This would only aggravate me further. So in my less resourceful state, I decided to upload and publicly shame the driver. There are a couple of problems with this. The likelihood that he/she would see it is all but impossible. The likelihood that he/she would even care is even less likely. 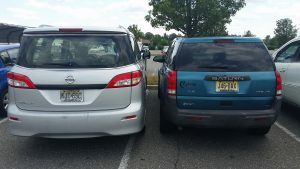 Consider the person who drives into a parking lot, chooses a space that is 15 steps closer that he/she can’t fit into and then leaving their car without even checking. This person clearly has a very self-centered perspective in life. The idea that they would care about anything that concerned anyone else is virtually impossible. So what did I gain by posting this. Well, if I perhaps wanted to raise awareness in all my friends to be more courteous, maybe I could go there but that would be a rationalization. Clearly, I posted it out of anger and I got nothing but lost a lot more. All I did was get my friends to say what they would do to that individual if it happened to them. Believe me, I thought of other actions as one is apt to do when they are angry. I didn’t go that route. It is possible that I may have done far more damage to my reputation than my knees or my car. One of the things that I detest about the current political environment is that people have a belligerent attitude about those who think differently than they do and they have a right to offend an entire group. I believe that I may have contributed to the lowering of discourse in social media…as if it could go any lower. I choose not to be a part of this. It does not do me credit nor does it help anyone who is out to “one up” the previous inappropriate response to the situation. It’s how we’ve gotten to where we are. I apologize for that. I will link to this blog post…but I won’t continue to feed the beast and will remove the post soon.